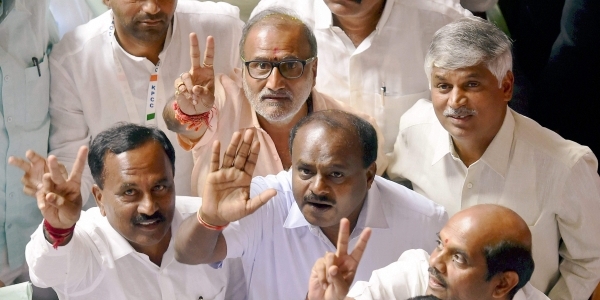 JD(S) leader H D Kumaraswamy will take Oath as Chief Minister on the 23rd May at 04-30 Pm as per link https://economictimes.indiatimes.com/news/politics-and-nation/kumaraswamy-to-take-oath-as-chief-minister-on-wednesday-at-4-30-pm/articleshow/64262300.cms. Please refer to my Article “Kumaraswamy to swear-in as CM on May 23: A Bolt From The Blue As Per Simhasan Chakra” link https://www.astrodocanil.com/2018/05/kumaraswamy-to-s…-simhasan-chakra/ ‎ dated 21st May 2018 at 18.00 hrs . Lagna Lord Venus is in Paap Kartari yoga and Dipositor Mercury in the 7th house has aspects by Retrograde Jupiter. Lagna Lord has Malefics in square Position and hence struggle and strife. 10th house of the chart should be strong, unfortunately Rahu is placed there and is in Venomous motion from the 20th May to 23rd May 2018 and has aspects of Exalted Mars . Position of Moon, Saturn, Sun and Rahu has to be seen to see the fructifications in the Oath Chart. Here in the Simhasan Chakra Moon, Saturn and Rahu are Placed in the Aasan Nadi and the Most Malefic Parameter in the chart for Down fall of the King . The Worst Parameter is Saturn is Retrograde and Rahu In forward motion along with Moon in this Nadi Aasan and is a dreaded combination and as per the Book of Mundane Astrology By Ms Mehta and A Radika , it is a dreaded combination and destroys the King , hence the king can have a Fall from the Position Sun is also in the Patta Nadi and Not good . For Protection against evil Jupiter placement is in Patta Nadi is not good .